The NSL-F is a 4-wire sensor for continuous measurement of filling levels in metallic vessels of height of up to 3 metres. This innovative level switch is based on the new modular device platform, a system of building blocks that permits a high degree of flexibility for assembling individual sensor components. In addition to the many advantages of the modular design, users also ­benefit from the reliability of the sensor, even when using it to detect highly adhesive and foaming media. Thus, the empty tank indication operates reliably even where considerable foaming is present. • Modular design for maximum flexibility. • Standardised components for cost effective stock holding. • Suitable for foamy, adhesive and pasty media. 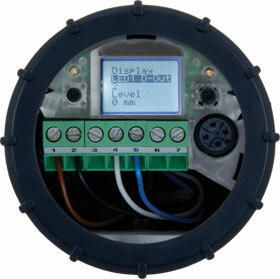 • Short response times, ideal for rapid control tasks. • Quick setup due to appropriate factory settings.